New standards in quality and output. 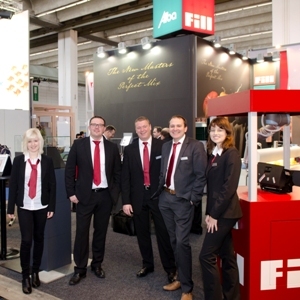 Fill and ALBA Tooling show the future of plastics production at Euromold 2012. New methods in the production of multi-material systems in high-volume production were presented by Fill and its partner ALBA Tooling at Euromold from 27 to 30 November 2012 in Frankfurt. Fill increases productivity and quality in its projects through structuring of the process chain and utilization of all networking options.”The combination of polyurethane with other materials harbors enormous potential. This was confirmed emphatically in many discussions with customers at Euromold 2012. Thanks to many years of experience in the field of automation, we can offer our customers genuine added value,” reports Wilhelm Rupertsberger, Manager of the Plastics Competence Center at Fill. Frankfurt/Gurten, 06 December 2012 – At the Euromold international trade fair in Frankfurt, it was clear to see that developments in the field of plastics production are heading towards hybrid concepts. Components with outstanding product properties are being created through the targeted combination of polyurethane with natural materials. Functionally optimized polyurethane is being combined, for example, with wood or ceramics and allows products with a wide range of uses to be developed. Together with its partner ALBA Tooling, Austrian machine engineering company Fill is a pioneer in this field and presented tried and tested production processes for high-volume production to the specialist trade audience. From the raw material to the tested component. At Fill, efficient production systems are coordinated optimally with one another and deliver custom-made solutions. In the field of optical quality control, Fill’s sister company Weitblick Systems has developed a flexible optical inspection process with the robot-controlled RV1000 camera system. Objects up to a size of 1000 mm can be inspected fully automatically with the RV1000 robot inspection cell. Fill is a leading international machine and plant manufacturing company for diverse branches of industry. The family-owned business excels in the use of the latest technologies in management, communication, and production. Business operations encompass the fields of metal, plastics and wood for the automotive, aircraft, wind energy, sport and building industries The company is the global market leader in ski and snowboard production machines and aluminum core removal technology.